This is my weekly journal quilt 33/52 2008, 6″ x 8″. This piece is a study of a process that I have been percolating since 2006 in my sketchbooks. It is what I call an “inside out quilt”. It is the seams of the quilt that are being presented on the face of the quilt. When I was creating a baby quilt for a friend, I foundation pieced the blocks and the back of the quilt top had these phenomenally interesting lines created by opening the seams. Normally these seams would stay on the reverse and then covered with batting and a backing. The pieces of yellow and black and white fabrics are foundation pieced to a black base fabric so that you see the interesting stitching (in yellow thread) from the front as well. Foundation piecing means that instead of just stitching 2 pieces of fabric together, you stitch them to a base at the same time. This piece also involved cutting pieces up and reassembling them with a zigzag stitch. This piece has no batting. On the back I attached a piece of tulle instead of an opaque backing so you could still see how the quilt was created. I find these colors are not working for me, so I am trying them in a different combination for the larger work. This is my weekly journal quilt 32/52 2008, 6″ x 8″. I needed some fabric sunshine! Art helps keep me sane in general, and this piece I made to work out some negative energy I had going on. 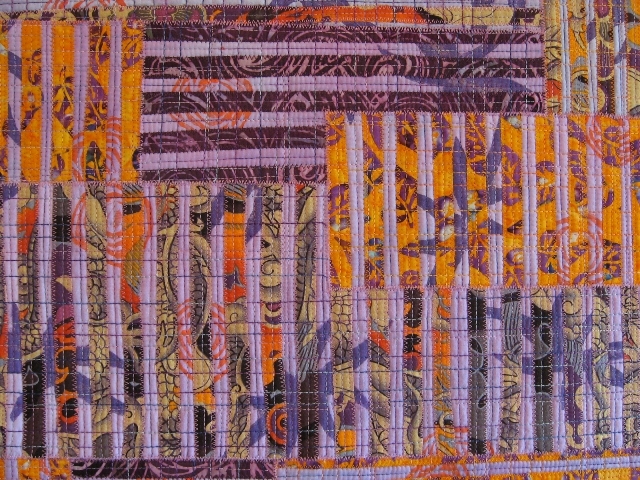 This piece began when I was rummaging through things in the studio, and I saw the yellow/orange piece of hand-dyed fabric. (Thank you Laura Wasilowski!) I was feeling tired and frustrated, as well as annoyed with a rainy day, and the piece of fabric immediately resonated the yellow brightness I wanted to feel as well as the orange fire of angst I was dealing with. I decided that a background of a piece of green and blue fabric that I had painted would be a nice start to embody the earth. I then cut and fused the sun and rays to extend into the world. I stitched a wobbly spiral in the center of the sun to show that one good (and even imperfect) thing can work it’s way out to reach many places. I also stitched wavy quilting lines on top of the sun motif, fused over dyed fabric to the back of the piece, and lastly zigzagged the raw edges. Now, THAT is a journal quilt! This is my weekly journal quilt 31/52 2008, 6″ x 8″. I started with a painting clean up cloth as the background piece to give the surroundings some interest. I tried a solid color for the background, but this was more interesting and I really like the purple blotches of paint at the top of the piece. I then reached into my grab bag of fabrics that already have wonder under fused to them and pulled out the piece of purple batik and started cutting leaves. After I fused them down, I added stems to ground them, as they seemed to be floating a bit too much. Next I stitched/quilted the piece to the interfacing background with variegated threads. Lastly, I added the back and zigzagged around the edges. This is my weekly journal quilt 30/52 2oo8, 6″ x 8″. I found the base black and white fabric for this piece as I was walking by the remnant bin at a fabric store. It jumped out at me and I’m pleased I took it home! It is a lovely sheer polyester print in a dot and grid design. I fused squares in various types of sheer and opaque green silks and blends on the center squares of the designs. These were tiny pieces I hand dyed limey green in a workshop in 2006. Then I quilted it to the background interfacing with variegated green thread. I added “x” motifs on top of the green squares in thread. Lastly, I zigzagged the edges to finish the piece. Because of the sheen of the fabrics, this piece catches the light particularly well and has a nice glow.